Typography is currently a trendy design technique combined with graphic design recognized worldwide. More than a trend, it has become a staple in most print and motion works for personal and commercial use. The art of typography is so talked about — so much that an iPhone app was developed to host the history and some controversial stories of typefaces. Most people think typography is all about finding cool fonts and placing them on a colored background when in reality, there is so much about this art form that is overlooked. Here is a mini bible for typography beginners to send you off with a good start. It’s not necessary for typography to be in different colors or fonts, but there should be at least one contrast. Otherwise, your work will be no different from words typed on a book. You may use color scheme generators to help you find which colors work together. If still undecided about how to give contrast to your work, you may also use the no-fail dark-light technique wherein you pair one dark color with one light color (e.g. black and white). Watch out for fonts that may be too similar to one another because they might confuse your audience and mistake it as poorly-constructed work. Go for different font weights (bold, light, book). Pairing a serif and a non-serif font always works, too. Typography is art but it still needs to make sense. Many commercial works use typography because of its visual appeal but sometimes, graphic designers fail to get the message across with their work because of poor layout. Make sure your designing typography for a purpose and not for the sake of making things pretty. It doesn’t matter how many layers you have or how many filters you use, if no one can understand your work, consider it null. New fonts come out everyday and it’s easy to download each one for free, but the hard part is narrowing down your favorites for a certain project. Always remember the purpose and mood of your work in picking out fonts because there are some which depict a certain mood or era, and you wouldn’t want to be caught dead using a western font in a science project. Try to use a maximum of 2-3 complementing fonts to keep your design clean and professional. “I like this font. I’ll adjust the kerning and height. The next word is shorter; I’ll have to stretch it. I like this other font, too. Repeat from the top. I’ll add geometrical figures, paper texture and a gradient background.” New designers get excited with the endless release of free design freebies and end up using unnecessary tools to improve their work. Don’t use all the Photoshop tools you downloaded on one piece just because you can. Playing with different patterns, brushes, and presets can be very fun, but when it gets down to business, playing is not allowed. 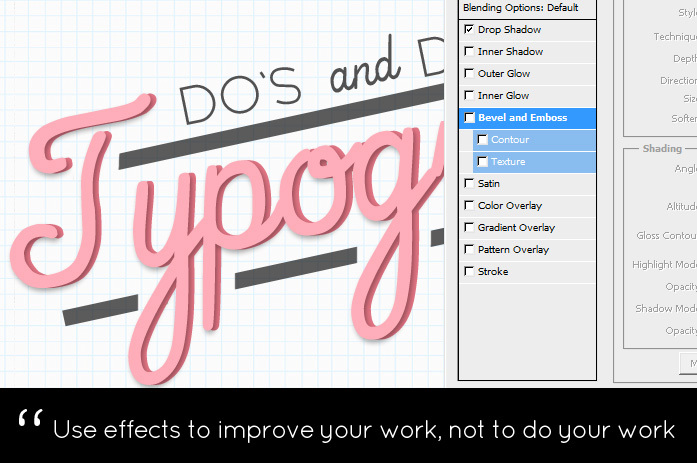 Know the tone and mood of your artwork to know the direction you’re going—not just with your fonts, but with every other aspect of your work—so as not to overdo your design. Adding a shadow is the easiest (not to mention earliest) way of modifying your type but there are proper ways of doing so. There are different types of shadow and angles. The most common ones are seen above. Not all shadows are cool. Diffused drop shadows are tacky and should have died in year 2000, that’s why many designers are told to avoid them. Keep in mind that visual design is not scientific. It’s okay to have a colored shadow instead of a gray one — it actually adds creativity aside from depth. 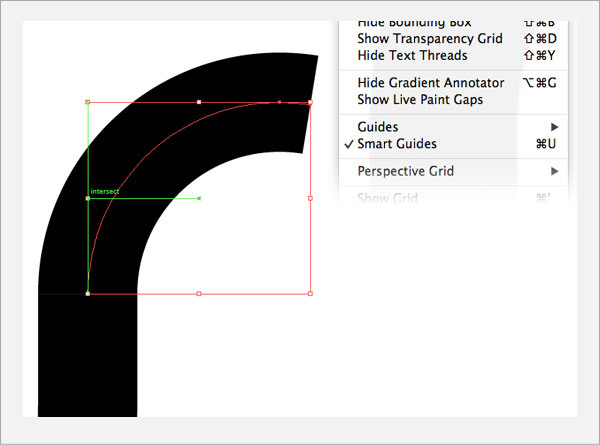 When working with grids, it’ll be hard to align without margins and smart guides. We’re lucky that the drawing software we have today are equipped with guides that automatically stops us from making alignment mistakes. When rendering a layout with chunks of text, always consider your reader’s ability to read. Unless intended, give your words space to breathe. Make sure there is enough space in between lines, letters, and paragraphs. Regretting to add space to your work is like grabbing words by the neck– your work will look constricting and restricting which are 2 words that shouldn’t describe art. While others are letting Illustrator or Photoshop’s blending options do the work for them, it’s easy to tell good typography from the bad. Real artists use effects to improve their work, not to do their work. Mad drawing and design skills still come first. Use them sparingly and only when necessary. When using effects, play with the different options and always modify the values until you get your desired output. Design is forever evolving. 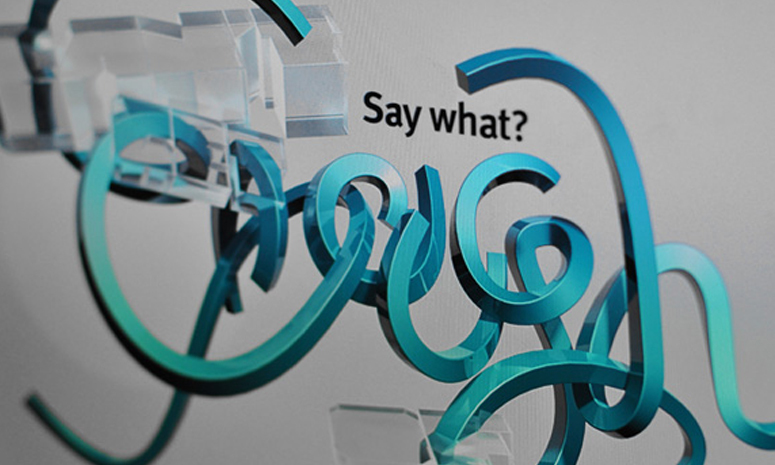 In 2004, there were very few artists who dared to combine digital art with typography. Nowadays, it’s as common as liking a post on Facebook. We see typography everywhere — in the streets, in billboards, in pop-up ads, and even on the shirt of the guy next to you. Read up on emerging trends and classic practices and incorporate both old and new techniques in your work.